We were at Kingdom Bound (a big Evangelical music festival) where the "Newsboys" played. The non-denominational Evangelical lead singer Peter Furler said, "we should not have 'lone wolf' Christians evangelizing, it creates chaos, every person should be under the authority of a pastor and every pastor under the authority of other pastors ... there should be a structure of authority." Here was a non-denominational Christian basically describing the structure of the Catholic Church as a model for evangelization. 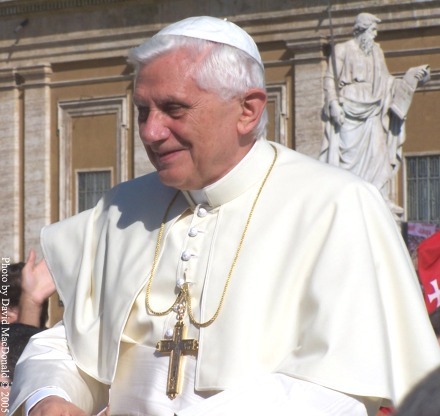 Photo: Pope Emeritus Benedict XVI (2005-2013) I took this photo of Pope Benedict in Rome. The press jumped all over Pope Benedict XVI for his comments about Islam. They said an "infallible Pope" should not make such a political blunder. That really has nothing to do with infallibility (Pope Benedict's controversial speech where he spoke about Islam is here). Sure the Pope can make political and PR mistakes. He's not a politician and he doesn't have a Madison Avenue PR firm managing his communications. One of the most misunderstood things about the Pope is this "infallibility" thing. Some Evangelicals think infallibility means that Catholics claim that every word that comes out of the Pope's mouth is supposed to be infallible. The Pope is not an oracle, he is infallible on the rarest of occasions, as we know…"
What the Church is saying with the doctrine of infallibly is that Christ is protecting his flock by giving the Pope the ability to say the right things when making official statements about faith and morals. The Church claims that these proclamations are "infallible," not that Church leaders are "indefectible." Most certainly everybody in the Catholic Church has defects (including its leaders), just like evangelicals and all humans. The doctrine of infallibility has nothing to do with the brainpower, intuition, moral fibre, or even the faith of the Pope. The doctrine of infallibility has everything to do with God protecting his Church. It's amazing that even during medieval times when there were some questionable and even bad Popes, God kept them silent on issues of faith and morals during their office. The Pope must speak ex cathedra (from the Chair of Peter) in his official capacity. "The Chair is - let us say it again - a symbol of the power of teaching, which is a power of obedience and service, so that the Word of God- the truth! - may shine out among us and show us the way of life." The decision must be binding on the whole Church. It must be on a matter of faith or morals. He must be intending to teach. Some Evangelicals wonder how this mystery and miracle of infallibility could be possible. How can an imperfect human, under some conditions, speak infallibly? We have to ask ourselves "is Jesus capable of protecting his flock in this way?" The answer is that Jesus can do anything. Christ promised to guide and protect his Church and to send the Holy Spirit to lead it into all truth. (Mat 16:18-19, 18:18, 28:20; Jn 14:16, 25, 16:13). The Holy Spirit guided the Church when it decided which books were to be included in the Bible. That was an infallible decision. Praise God! Certainly many who are reading this have had experiences where God made something very clear to them through the Grace of the Holy Spirit. How much more would He want to do that for someone who has been trusted to lead and influence millions of Christians. This is a short discussion about Peter as the Rock. A full discussion exploring the Greek, Aramaic Biblical text, the history, early Christian quotes, and more is here. Peter as the Rock will be the foundation of the future community, the church ... To deny the pre-eminent position of Peter among the disciples or in the early Christian community is a denial of the evidence. Was anything hid from Peter, who was called the Rock, whereon the Church was built; who obtained the keys of the Kingdom of Heaven, and the power of loosing and of binding in heaven and on earth? A full discussion exploring the text of the Greek, Aramaic, grammar, history, early Christian quotes, and more is here. Catholics believe that Jesus had a very specific purpose in saying that Peter was the Rock upon which he would build his Church. He was evoking Isaiah 22:22. 22:15 (Shebna) you have cut out a tomb here for yourself ... in the rock? ...I will thrust you from your office... 22:20 On that day I will call my servant Eliakim son of Hilkiah, 21 and will clothe him with your robe and bind your sash on him. I will commit your authority to his hand, and he shall be a father to the inhabitants of Jerusalem and to the house of Judah. 22 I will place on his shoulder the key of the house of David; he shall open, and no one shall shut; he shall shut, and no one shall open. 23 I will fasten him like a peg in a secure place, and he will become a throne of honor to his ancestral house. 24 And they will hang on him the whole weight of his ancestral house, the offspring and issue, every small vessel, from the cups to all the flagons. ...you are Peter and upon this rock I will build my Church; and the gates of hell shall not prevail against it. And I will give you the keys of the kingdom of Heaven, and whatever you bind on earth will be bound in Heaven and whatever you loose on earth will be loosed in heaven. In the Isaiah passage, Shebna was the Chancellor (like a Prime Minister) under King Hezekiah. This Prime Minister had a special role above the cabinet. He got the keys to the kingdom. Shabna messed up and was unfaithful so God appointed Eliakim to Prime Minister and gave him the keys. In Mat 16:18, Peter got the keys just the way Eliakim got them in Isaiah 22:15-24. When Jesus says "whatever you bind" to Peter in Matt. 16:18, the Greek text used for "you" is singular. In Mat 18:18 the Greek text, the word for "you" in "whatever you bind" is plural. Catholics think these two juxtaposed but similar phrases lay out the early structure of the Church with Peter as the Pope and the other apostles as priests. I heard a great Evangelical Christian song by the band Audio Adrenaline that says, "I want to be your hands, I want to be your feet." Most Evangelicals understand that Jesus needs people to do his work on earth. Catholics are saying that Jesus wants someone to lead his people on earth. This person is not taking Jesus' place, he is simply guiding the Church the same way Peter did when he stood up in the upper room, and told the apostles that they must replace Judas, and do so with someone who had traveled with them from the time of John the Baptist (Acts 1:15). As the head of the apostles his duty was to guide the apostles and oversee a successful unanimous outcome. Catholics think Jesus is still doing that through Peter's successor today. "The Pope is not an absolute monarch whose thoughts and desires are law. On the contrary: the Pope’s ministry is a guarantee of obedience to Christ and to his Word. He must not proclaim his own ideas, but rather constantly bind himself and the Church to obedience to God’s Word, in the face of every attempt to adapt it or water it down, and every form of opportunism." Jesus said "Upon this rock 'I' will build my Church." Jesus is the head of the Church. Catholics believe the Pope is simply his "vicar" on earth, the one who He has appointed. The Pope could sing the song, "I want to be your hands, I want to be your feet." Jesus is the King which in Isaiah 22:22 is represented by King Hezekiah. Peter is the Vicar on Earth which in the Isaiah 22:22 passage is represented by Eliakim. The Pope's role is kind of like that of a chairman of a board, or captain of a football team, with the other team players being the bishops. It has been like this since the dawn of Christianity. The owner and leader of the team is Jesus. Catholics don't think the Church is "man-made." They think it is God made. Jesus said "Upon this rock 'I' will build my Church." (Mat 16:19) He did not say "you" will build my Church. Catholics think the Church was conceived at the Pentecost, when the Holy Spirit descended on the Apostles. (Acts 2:3) Catholics believe the Holy Spirit has been resting on the Catholic Church ever since. An historical timeline of the early Church is here. "There is one God and one Christ and but one episcopal chair, originally founded on Peter, by the Lord's authority. There cannot, therefore, be set up another altar or another priesthood. Whatever any man in his rage or rashness shall appoint, in defiance of the divine institution, must be a spurious, profane and sacrilegious ordinance." Jesus told Peter to "feed my lambs ... tend my sheep ... feed my sheep." (Jn 21:15-17) The difference between a sheep and a lamb might be significant. A lamb is a baby, a sheep is an adult. Perhaps Jesus was asking Peter to take care of both the general people (the lambs), and the apostles (sheep). Regardless of that interpretation of sheep and lambs, is clear Jesus is asking Peter to feed and tend his flock. That is what a shepherd does. It appearsthat he is asking Peter to shepherd his Church on earth, on his behalf. An Orthodox priest who doesn't believe in the primacy of Peter, pointed out that James made the decision over the circumcision issue in Jerusalem, not Peter. (Acts 15:19). James was the Bishop of Jerusalem, it totally makes sense that James would say that. He made that decision based on Peter's (Simeon's) discourse (Acts 15:14). His decision was a response to Peter's directive. Does Ephesians 2:20 refute Matthew 16:18? Some Evangelical apologists point to Ephesians 2:20. 1 So then, remember that at one time you Gentiles by birth,[b] called “the uncircumcision” by those who are called “the circumcision”—a physical circumcision made in the flesh by human hands— 12 remember that you were at that time without Christ, being aliens from the commonwealth of Israel, and strangers to the covenants of promise, having no hope and without God in the world. 13 But now in Christ Jesus you who once were far off have been brought near by the blood of Christ. 14 For he is our peace; in his flesh he has made both groups into one and has broken down the dividing wall, that is, the hostility between us. 15 He has abolished the law with its commandments and ordinances, that he might create in himself one new humanity in place of the two, thus making peace, 16 and might reconcile both groups to God in one body[c] through the cross, thus putting to death that hostility through it. [d] 17 So he came and proclaimed peace to you who were far off and peace to those who were near; 18 for through him both of us have access in one Spirit to the Father. 19 So then you are no longer strangers and aliens, but you are citizens with the saints and also members of the household of God, 20 built upon the foundation of the apostles and prophets, with Christ Jesus himself as the cornerstone. [e] 21 In him the whole structure is joined together and grows into a holy temple in the Lord; 22 in whom you also are built together spiritually[f] into a dwelling place for God. The passage is about the ingrafting of the Gentiles into the people of God. It is not a passage intended to explain the hierarchy of the apostles, or the Church. Matthew 16:18 sets the order of the apostles. Paul is stating these things after Jesus said to Peter "feed my sheep" (Jn 21:15-17). Peter's primacy is well established. When Paul says "the apostles AND prophets" he is demonstrating the wider context of the people of God, rather than the specifics of how the apostles should relate to one another, and who is their leader. Peter's role is a collegial one among the apostles, like the captain of a basketball team rather than that of a CEO of a company. So naturally, in a context such as this he will just say the apostles, rather than "The Prophets, Peter, the Petrine office, and the Apostles who will be bishops". That would be a very distracting sentence, and deviate from the main point which is about the Gentiles. Just as the Israelite community was built on the 12 tribes with Aaron as its priest, the new covenant people of God are built on the 12 apostles. However, that does not diminish the fact that one of these 12 were appointed to be their leader. How could Jesus have decided to build his Church? Jesus asked the apostles, "Who do they say that I am?" (Mat 16:13) He was referring to the general people, their democratic voice. They replied, "Some say John the Baptist; others say Elijah; and still others, Jeremiah or one of the prophets." In other words, no unity, no certitude. Leave the government to the people and you get no unity. Then he appealed to the aristocracy, the apostles, but there was no answer, (Thomas doubted, Judas was in money, Philip was troubled about relations with the heavenly father.) Jesus could not build his Church on an aristocracy alone. At this point one man comes forward without the consent of the others. It is Peter, who says "You are the Christ, the Son of the living God." It is the right answer. Here was one man, divinely illuminated, speaking for all, who confesses the divinity of Christ, who is to be chosen as the leader of the Church. This is the Theocratic form of the Church that Catholics believe Jesus chose. This is what God did when he chose Abraham, Isaac, Jacob, Moses etc.. Jesus is the big rock, and Peter is a little rock, acting on behalf of Christ on earth, giving the keys to him. Peter, who was given the keys, died in Rome and that's where his successors were. Meanwhile in Jerusalem in 70 AD a great persecution made the Church almost completely inactive there until about 130 AD. Just as the Old Testament is full of foreshadows of the New Testament, Catholics believe the Bible is clear that the New Jerusalem of the Book of Revelation is not the historic city of Jerusalem. After the death of Jesus, the Old Testament prophesies about Jerusalem were clearly understood as a reference to God's people rather than the historic city of Jerusalem. This paved the way for the move to Rome. Jesus wanted the Gospel preached through all the world. If there had not been persecutions in Jerusalem it is questionable how far the Gospel would have traveled. The persecutions forced the apostles outward. We see in the book of Acts a powerful movement to establish the Church in Rome. That is where the book of Acts finishes. St. Luke states, “This is how we finally came to Rome” (Acts 28:14). Some Evangelicals think the Book of Acts ends too abruptly. They fail to see that the establishment of the Early Church in Rome was the goal and Luke ends his book when this is accomplished. There is no biblical evidence of a power struggle between St. James (the Bishop of Jerusalem) and St. Peter. “Simon, Simon! Remember Satan has asked for you (Greek plural-“you all”), to sift you all like wheat. But I have prayed for you (Greek singular-“you alone”) that your faith may never fail. You in turn must strengthen your brothers” (Luke 22:31-32). Peter oversaw the grafting in of the Samaritans, and then the Gentiles. This could have wrecked the faith, but under Peter's guidance the Church went along with it, because he was their leader. Jesus said "make disciples of all peoples" (Mat 28:19) and that could best be accomplished through the communications centre of the world, which was Rome. From a clearly practical standpoint, it's hard to imagine how the Church could have succeeded with the Pope in Jerusalem. Jerusalem has been in a constant state of turmoil, and has been conquered many times. Jerusalem was under Islamic rule for many of centuries since the time of Christ. We can imagine the fate of the seat of Christ under Islamic Rule. It would have been a disaster. God knew what he was doing when he moved the seat of the Church away from that hotbed. As shown above, most reformers understood Peter to be the rock. The reason they could say this and still claim that the current Pope is not the same rock as Peter is that they think Peter's authority died with him. Catholics think this is a mistake. In Matt.18:16, true to his usual form of teaching, Jesus was invoking an old testament Scripture. In this case it was Isaiah 22:22. If we look at this passage, we see the precedent of succession to which Catholics believe Jesus was referring. In the Old Testament, the office of Chancellor was a dynasty that had successors. This was evidenced by the reference to an office, a throne, a robe, authority, and the keys. This office also sounds a lot like a present day Pope. The key holder is called a father. This appears very much to be the language of succession. Even the reference to the "House of David" in Isaiah 22:24 points to the issue of succession. David had died 400 years earlier. Jesus is also in the lineage of David. Jesus was King and certainly had the authority to give Peter the chancellor's (Prime Minister's) keys that God had given to Eliakim. Keys are a permanent kind of thing. Jesus didn't say "I'll take them back after you die". That would not make sense. Catholics think Jesus gave Peter the "office" just as Eliakim had been given the "office". Jesus gave Peter power to bind on earth. So Peter had power to name a successor, which Catholics think he did. He gave the keys to Linus, who gave them to Anacletus, who gave them to Clement. While in Corinth, St. Clement, who was the Pope in 96 A.D., wrote appeals for the memory of the two martyrs, Peter & Paul (epistle to the Corinthians 5:3-7) He explicitly referred to the Apostles who appointed bishops and made provisions for their succession. I was recently in Rome and took the opportunity to visit the Catacombs. It was a very moving experience. The early Christians set up a separate room specifically for the Popes. 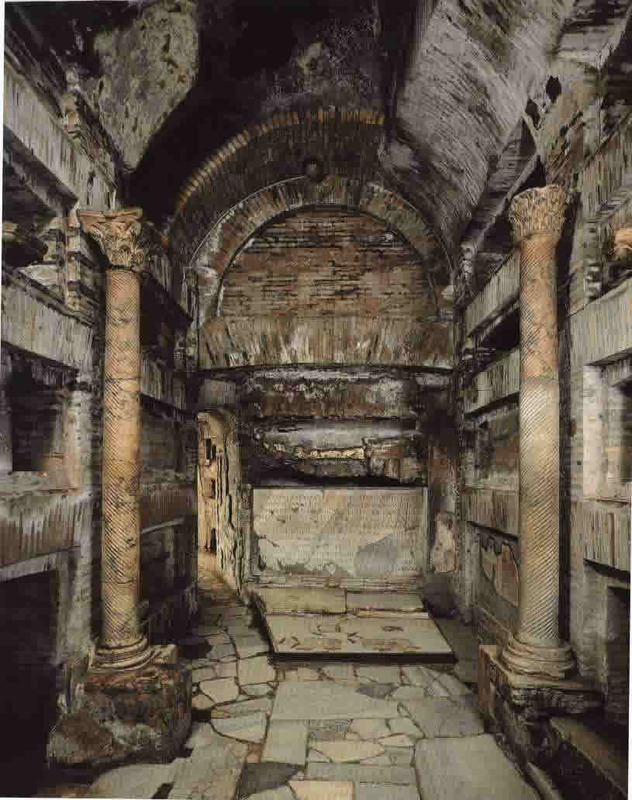 This room contained the remains of 9 Popes from 235 A.D. to 283 A.D. The early Christians understood how important it was to have a leader. Each one was in succession of Peter. Buried here were the following Popes. In brackets are the years they served. A complete list of all the Popes is here. Catholics believe Peter was the first Pope and that there has been succession to this day. There have been 266 Popes. The keys have been handed down. The Catholic Church can trace historically through each era until the present day. A timeline of the early Church is here, There is a section explaining Priestly succession here. How come the word "Pope" is not in the Bible? The "Pope" is not really an office, but merely a nickname for the Bishop of Rome. St. Peter ended his days as the Bishop of Rome, and the Bishop of Rome succeeds to the ministry of St. Peter as the head of the universal Church. "Pope," is merely a nick-name from the early 300s. It comes from the Greek word "papa," that means "father" or "patriarch." It was not exclusive to the Bishop of Rome himself. Rather, in the very ancient Church, there were three regional patriarchal bishops (1) Rome, (2) Alexandria (in Egypt), and (3) Antioch (in Syria)in that order of primacy. All three of these bishops derived their authority from St. Peter and from ties of discipleship between Peter (in Rome) and his disciples Mark (in Alexandria) and Evodius (in Antioch). It was necessary to have patriarchs in different parts of the world when fast communication and transportation systems did not exist. Someone told me there are upside down crosses in the Vatican, and that proves the Papacy is from Satan. Is that true? Peter requested to be crucified upside down because he felt unworthy of dying on the cross the way his Lord and Saviour died. 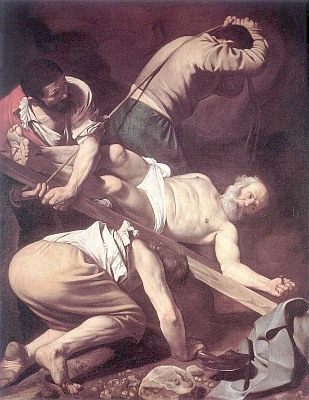 Ever since the time of Peter's death, the Church has symbolized Peter's martyrdom with an upside down cross. This is called a "Petrine Cross." The Vatican is built on the place where Peter was martyred. The Pope sits in the seat of Peter and therefore there are "Petrine" crosses (upside down) in the Vatican. The Church will not discontinue the Petrine Cross (Peter's Cross) just because satanists are trying hijack the Cross to mock us. Nor will the Church discontinue a 2000 year old tradition that was recognized by all Christians until the 1500's because some Evangelicals are confused as to its meaning. When I was in Rome, I visited the jail where tradition reports that Peter was held. 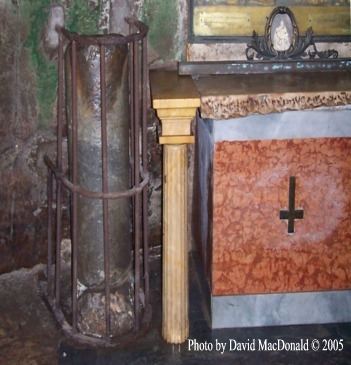 In the picture above there is the pillar where tradition says Peter was chained. The altar next to it was built in the middle ages and has upside down cross, symbolizing the way Peter was crucified. Doesn't the Bible say "call no man father?" Why do Catholics say "Holy Father?" Some Evangelicals point to the Scripture passage "Call no man your father?" (Mat 23:9-10) as a reason not to call priests "father." In the same sentence Jesus says "Nor are you to be called instructors, for you have one instructor, the Messiah." Using this passage to claim that we cannot call a priest "father" would mean that we could not call professors at an Evangelical Bible college "instructors." If we were to take this passage literally, it would mean that I could not call my earthly dad "father" either. Catholics don't believe Jesus was forbidding the use of "father" in that passage. There are plenty of examples in the Bible where that the word "Father" applies to humans, and the Bible links the priesthood to fatherhood. (Judges 17:10, 18:19, 1st Thess. 2:10-11, Acts 4:25, 7:2, 8, 14, Philip. 2:22,Hebrews 12:9, 1st John 2:13, 14 , 1st Cor. 4:15, 1st Thess. 2:11-12.) Catholics believe that Jesus was condemning the hypocrisy of unholy men who were in office at the time, he was not condemning their office. How come the Pope lives in luxury, gets lots of kudos, and doesn't live a humble life? "It seems that the Pope (bishops and other Catholic clergy) wears really fancy and expensive clothes, lives like royalty, and has people bow to him, kiss his ring - are those traditions from Peter?" The Pope is not only the Bishop of Rome and the head of the Church but he is the leader of a country, the Vatican. We take good care of the Pope. He's over 80 years old! We feed him well, dress him well, give him a good doctor, give him a comfortable bed so he sleeps well and stays healthy, give him a bullet proof vehicle so crazy people don't kill him. He is working long hours, and has dedicated his life to the Church. It's a lot of work to elect a new Pope, and we don't want them always dying on us, unnecessarily. We must remember that the early Church did not want people to run out and try to get themselves killed for the faith. They said "avoid becoming a martyr if you can, but don't compromise your faith." And that is the spirit with which we are taking care of our Pope. The early apostles such as Peter, received a great deal of respect from the faithful. The Pope actually lives a life that is more frugal than almost any leader in the world. He lives in the papal apartments, smaller than most TV evangelist's homes. He doesn't have his own airplane, transportation is chartered by commercial carriers, he doesn't wear a crown or anything like that. His vestments are no more expensive than James Dobson's suits. Of course they are well pressed and well washed. He has a big cross around his neck to show that Jesus is the focus. At over 80 years old, he works over 50 hours a week. We don't know how he does it. So of course we want to make him as comfortable as possible. There are almost no other world leaders who would work 50 hours a week at over 80 years old. They are living in mansions, and are in happy retirement. Our Pope will likely work until the day he dies, like most of the other Popes throughout history. He gets on both knees and kisses the ground, every time he enters a Church in acknowledgment of the Lord who is Lord of all. Pope John Paul II kissed the ground of every country he visited. Most certainly there have been bad Popes throughout history. Historians would say there have been about 12 Popes out of 266 were morally corrupt. Benedict IX was a rotten Pope from 1032-1045 AD. He became Pope in his late teens and early 20's and was kind of like me in my early 20's, running around with many different women. He incited a riot in Rome because the people were fed up with him. Probably the worst Pope was Alexander VI (1492-1503). He had several illegitimate children before and during his reign as Pope. He was into bribery, deceit, debauchery and anything else you could imagine. Pope Innocent VII (1484-1492) and Pope Leo X (1513-1521) were from the Borgia and Medici families which were kind of like the Sopranos of the middle ages. They were infamous in Italy. These three Popes contributed significantly to the unrest that led to the Reformation. It should be noted that 78 Popes are Canonized Saints and 10 more are beatified, which means they were awesome Popes. Why did Popes become heads of states? Basically, the biggest reason that the Pope was head of his own country is that it is important that the Church not be interfered with by any other political leaders and if the head of the Church was in a country governed by a political leader it would be vulnerable to outside interference. In the Eastern Orthodox Church there were big troubles because of political interference from the heads of states in countries where the Church was situated. This system of a Pope being a political head of state is certainly not perfect because ancient Popes sometimes became overly ambitious politically. However, history shows us that God had a way of knocking them on their butts when they did, as in the 1527 sack of Rome by the Germans. God did the same kind of thing to the ancient Jewish kings when they became too aggressively ambitious. Today, the Vatican is a tiny little state that is only about 2 square miles, and is occupied only by a couple of thousand people who work in the Vatican. This is probably a good balance. There is an article about why Popes became heads of states is here. Authority and hierarchy are hard concepts to sell these days. Businesses are adopting horizontal organizational charts. Kids are swearing at their school teachers. The public is pulling apart politicians. Perhaps these are all progressive ideas, but Catholics think this age has authority-phobia. We heard a sermon on the radio by a gifted Evangelical minister Dr. Tony Evans. He took us on a biblical tour or the hierarchical and structural authority in the heavens among the angels and heavenly creatures. He quoted the Bible chapter and verse to show that Angels only activate under authority, when they are told what to do by their superior. (Job, 38:7, Gen 3:24, 19, 21:17, 22:11, Acts 7:53, Ex 23:20-23, Judg 13, 6:11-24, Isa 6:5, 1 Kgs 19:5, Jude 1:9, Rev 12:7 etc.) It was a powerful testimony to the Catholic approach to Church (although We don't think Dr. Evans knew that). It showed that God is not at all afraid of structural authority. Catholics think the Hierarchical Structure of the Church was divinely inspired by God and revealed to those who formed it in the early centuries of Christianity. The Magisterium consists of the Episcopal College and its head, the Pope. It is based on the 12 apostles. Peter and the rest of the apostles made up a single apostolic college. So in like fashion the "The Roman Pontiff," Peter's successor, and the bishops, the successors of the apostles, are related with and united to one another." (Catechism 880). It is the teaching office of the Church. It is this Magisterium's task to preserve God's people from deviations and defections and to guarantee them the objective possibility of professing the true faith without error. This is where the infallibility thing comes into play. Most often these infallible declarations happen at an ecumenical Council. There have been 21 councils since the time of Christ. This magisterium is the glue of the Church. It is what keeps us all going in the same direction theologically. It is where we turn to find out what the Church really believes about something. Quite often the media will say stuff like, "55% of Catholics believe that gay marriage is OK" and similar such things. The media is often talking about people who don't go to Church anymore, who are not reading the Bible, who don't identify themselves as Catholic except when asked if they are Catholic for a newspaper poll. Thank God that the Church is not a democracy. The early Church was not a democracy either. Democracy works well for politics but not for faith and morals because people in general want to make things easy on themselves. Modern society thinks that the pathway of spirituality should be decided by the common people, that is why the New Age is so popular. Anybody can be a Guru and lead people down dark alleyways of Spirituality. In the New Age, everybody can believe whatever they want, can do whatever they want while still claiming to be God centred. That is part of the reason books like the Da Vinci Code that try to mix up Christianity with Gnosticism have become so popular. Gnosticism was a great heresy that was defeated in 300 A.D. but has resurfaced in the "New Age". Catholics don't believe that is Christ's way. Jesus please help us. The Church does not exist to be evangelized by society. It exists to evangelize society. It is in light of the Bible and the history of the early Church that Catholics are totally cool with having a Pope.